Yourself, your friends, your sister, other random moms. We all have insecurities as moms. We don’t need anyone highlighting them. Every mother has their faults. Every mother has their strengths, and weaknesses. No one is perfect. We bonded over summers up in Muskoka, and getting together for birthdays and holidays. I was single parented and babysat a lot due to my parents work schedules. I was given a horse, and competitions all paid for, as a way of my mom showing me her love for me. I ate a lot of crock pot meals. I skied and bowled on a team with my dad and brother, and to this day I have a mean left hook. I have 2 older sisters who were more like mother figures growing up because of our age difference. My mom and I are like fish. We love the water. I didn’t have much fear and I always pushed boundaries. I was usually respectful to my elders, and didn’t engage in drama. My teenage years were rebellious, and my mom didn’t do too much to stop me. That is until she moved our family away from the city into country living and I met my now husband and really settled down. All of that has shaped the woman and mother that I am today. So who do I think I am as a mother? I think I love my kids fiercely, and show them a lot of affection because it was the opposite of what I had growing up. I am easy going, let them make and learn from their mistakes. Kindness, sharing, and overall service towards others are important to me. Pettiness, drama, and whining drive me insane. I kiss every boo boo, and put bandaids on invisible owies. I love to see my kids do sports and activities. I also like to see them be bored and use their imagination. I like home cooked meals, but I won’t blink at a drive thru dinner, which means no cooking, and no clean up for me. My bathroom and kitchen never seem to be clean despite my best efforts. I don’t make enough time for my husband, and date nights because the season of young kids we are in is so fleeting. I like when my kids look nice, but I also like to see them be independent and encourage their own sense of style. Somedays Netflix is on far too much, other days the TV doesn’t get turned on once. My career and blog suffers because my kids come first. I quit a career I loved, and gave up travelling, and designer clothes because I want to be there for my kids, and give them everything in my human power. I love my kids. I would do anything for my kids. You see, the thing with motherhood is everyone is different. Our experiences in the way we were raised our different. Some of us were spanked, some of us were ignored, some of us had a lot of family turmoil. The other thing is, our kids are different. Some have stronger wills than others, some share better, some are easily likeable, and some are not. Some are picky eaters, some will eat anything, and some don’t like to eat much at all. Our family dynamics are different. Some of us stay home, some of us work full time. Some of our husbands travel for work a lot, some of our husbands, are home a lot, some are not there to help in the morning, or at bedtime, or ever. What we value is different. To one mom, manners and sharing are incredibly important, and to another social awareness and the ability to make friends is where the emphasis is put. Some breastfeed, some bottle feed – by choice or by necessity. Some eat a lot of take out, some have home cooked meals every night. As long as your kid’s bellies are full does it really matter to you how another mom chooses to feed her child? Some of us use a lot of technology to entertain our kids, some of us believe in minimal tech and all day outside play. Some of us care about our kid’s fashion, and put effort into their outfits, while some of us let our kids dress themselves, and if they go out in overalls, rain boots and a dinosaur hat, well heck we are just happy we made it out the door on time. Some of us believe that early teaching of the alphabet, letters, numbers, colours and the pronunciation of words are important, and others let the teachers do all that come kindergarten. Some of us put our kids in several sports, and activities and others have a more open approach to free play and developing skills that way. 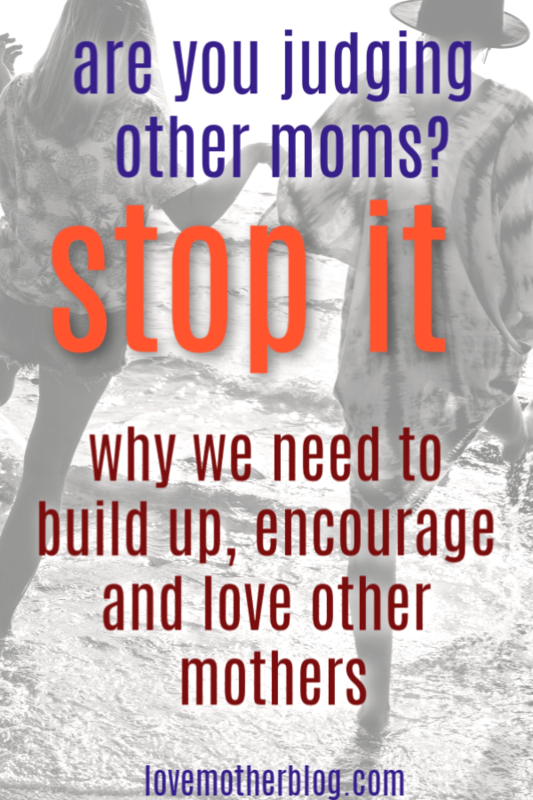 The thing is motherhood is not a competition, and we shouldn’t care what another mom is doing with THEIR children unless we suspect neglect or abuse. So instead of focusing on what another mom may be doing or giving another mom unwanted advice, look inside at who you are and who your kids are and just love them, pray for them, keep them alive, and teach them to thrive. It really is that simple. You don’t know someone’s story, and why they “mom” the way they do. So let’s just love and support each other, give advice when asked, and hold our lip at things we might not approve of. So if you are worried about what I think of you as a mother, please don’t. I am just over here being the best mom I can be, with the skills, strengths, and time I have. I only have my kids and my husband and my Lord to answer to, when it comes to my parenting. Motherhood is hard. What we need is support not judgement. We are different, our kids are different. Different doesn’t make it wrong, it just makes us different. End Of Story.